Make sure your voter registration is up to date by texting "CO2VOTE" to 28683 from your smart phone. CONEJOS COUNTY - will be selling their surplus inventory on the internet. For great bargains visit - www.publicsurplus.com. FREE access to the public. Only PUBLIC institutions sell their items on this site. Welcome to the official Conejos County website! We appreciate your interest in Conejos County, Colorado. We hope that our site is useful in providing visitors and residents with valuable information about ConejosCounty government and the community in which we live. As you navigate around our site you will find useful information for various services and community resources and answers to frequently asked questions. We hope that this information is helpful to you. Conejos County is located at the southern end of Colorado's beautiful San Luis Valley, the world's largest alpine valley. The county has an area of approximately 825,741 acres or 1,290 square miles (slightly larger than the state of Rhode Island). The eastern portion of the county is characterized by the nearly level valley floor which lies at an average elevation of about 7,700 feet. The stunning San Juan Mountains rise from the western portion of the county to a height of about 13,000 feet. Conejos County is bounded by the Rio Grande (River) to the east and the State of New Mexico to the south. Sixty-six percent of the county is owned by state or federal entities, including the mountainous areas that are part of the Rio Grande National Forest. Small towns and wide open farms and pasturelands characterize the remaining thirty four percent of the land that is privately owned. The county has five municipalities- Manassa, La Jara, Antonito, Sanford and Romeo- Manassa being the largest with a population of just over 1,000 people. As in all agricultural areas of the West, water is the lifeblood of the community. In addition to the Rio Grande, the county is traversed by the Conejos, Alamosa, and San Antonio Rivers and La Jara Creek, as well as hundreds of irrigation ditches that bring water to our fields. Conejos County was one of the original 17 counties created by the Colorado legislature on November 1, 1861. Although it was first called Guadalupe County it was renamed Conejos, the Spanish word for "rabbits", one week later. The original boundaries of the county included much of the southwestern corner of Colorado. In 1874, most of the western and northern portion of the county was broken away to form parts of Hinsdale, La Plata and Rio Grande Counties. Conejos County achieved its modern borders in 1885 when its western half was taken to create Archuleta County. 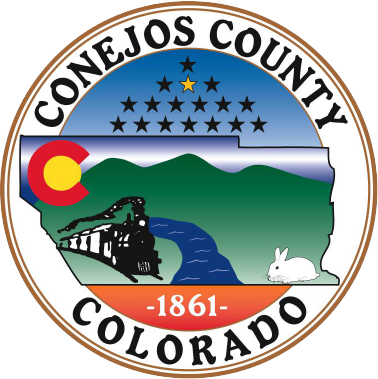 Today, County government is based in the community of Conejos. Because it is the site of some of the earliest settlements in Colorado, rural ConejosCounty contains some important historical sites. The town of Antonito is home to the Cumbres and Toltec Scenic Railroad, a narrow gauge steam engine railroad constructed in 1880 which makes the daily trek from Antonito to Chama, New Mexico during the summer and fall. Just north east of the town of Sanford is Pikes Stockade, the site where Zebulon Pike raised the American flag in 1807 over what was then Spanish Territory. The stockade was reconstructed using Pike's journal and is maintained by the Colorado Historic Society. Conejos, the County seat, is also home to Our Lady of Guadalupe Catholic Parish, the oldest parish church in Colorado. The community of Manassa hosts Pioneer Days each July. The event celebrates the arrival of Mormon pioneers and is one of the largest events in the San Luis Valley. The Jack Dempsey Museum, also located in Manassa, honors the "Manassa Mauler" who held the world heavyweight boxing title from 1919 to 1926.